Friday evening I retrieved a message from my voice mail from the hospital I was scheduled to have my surgery at, telling me they were able to move my ICD replacement surgery up to an earlier time. Unfortunately, I didn’t hear the message until after business hours and by then they were closed so I had to wait until Monday morning to call them back. First thing Monday morning, I called and my surgery was scheduled for the very next morning! I was immediately excited; not for the surgery, but due to the fact I knew I would be healed up and ready to start training for Grandmas Marathon in plenty of time. For the past six months, I didn’t know when I would be able to schedule this surgery because the procedure doesn’t take place until the device reaches a specific low voltage of 2.63 and for the last six months or so the device was at 2.64. No one could tell me the exact time it would drop that last .001 and reach the indicated 2.63 replacement voltage with any certainty. They could only guess that it would be soon. Nothing like planning for surgery the day beforehand! It was 9 a.m. Monday morning and I was now scrambling to figure out what needed to be done prior to my surgery. I left the office and headed home with the intention of attaching the snow blower to the lawn tractor in case we got any heavy snow, since clearing it off the driveway any other way would be impossible during my recovery, but once I got home I quickly got sidetracked with many other equally important task’s and finally succumbed to the fact I wasn’t going to get it all done. I took a deep breath and decided to try taking one thing at a time and did what I could before heading to the gym for the evening. 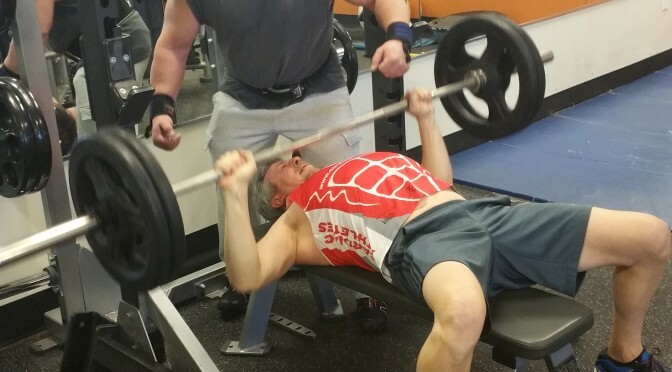 I was scheduled to work my chest muscles with Tony and had actually planned to try my max bench press of 225 lbs. I had been working pretty hard at the gym now for many months and was very close to making this lift but I knew if I didn’t pull it off tonight, it might be a long time before I was up to the task again. My upcoming surgery would pretty much render these muscles useless as they healed from the trauma. My ICD is a sub muscular implant, so to replace it requires an incision of about two inches, through the major pectoral’s muscle. I wasn’t sure how long it would take to heal to the point of doing push-ups or bench pressing any amount of weight again after the surgeon left his mark on it, but was relatively certain it would be a while. Heading to the gym, my mind started racing, wondering exactly what was in store for me the next day. This was the first time I had really put much thought into this surgery. Other than acknowledging the reality of needing to schedule the recovery of this surgery into my spring marathon training, I had intentionally avoided any other thoughts on the subject due to the negativity of it all. No matter how I look at it, I just can’t find anything to get excited about when it comes to seeing the doctor for any procedure(s), especially surgical stuff. I have not experienced one single medical procedure yet that was without some kind of negative consequence. Generally being optimistic, I did hope this time would be different. There were many new factors at play in my life that I hoped would favor a quick recovery without any incident(s), such as my strict adherence to a healthy nutrient dense whole foods diet and being in great physical condition due to my latest marathon training plus a regular routine at the gym. I was really hopeful all these things were going to pay off and provide my body the tools it needed for a quick recovery from this surgery but only time would tell. The ride to the gym gave me 30 mins to reflect and I thought back to the surgery when I first got my implanted Cardiac Defibrillator (ICD) seven and a half years ago. I don’t like to think about it because it was a pretty dark time for me. Seven and a half years ago I was a complete mess. The doctors had convinced me I was at death’s door. It didn’t take much because everyday I felt like I was dying. The heart attack and sudden cardiac death experience had left me with diminished heart function, I took a daily cocktail of 12 different medications and I had a pacemaker… Hardly things to make one feel invincible. Recovery at all, let alone coming anywhere close to the physical condition I was in before these events, didn’t seem possible and the doctors kept telling me I had to accept this new reality of having a wounded heart. I was told over and over again by doctors that regaining my heart function wasn’t possible and I would need to live within strict limitations for the rest of my now shortened life expectancy. At the time, I got so dizzy when I stood up I had to hold on to something to avoid falling. Any amount of physical activity created sharp pain in my chest and made me short of breath. I carried Nitro pills with me everywhere I went and, due to my blood thinners, I experienced really bad bruises with even very light bumps from furniture, etc… and since I got dizzy all the time, I was constantly crashing into things just walking around the house; sometimes I felt like I was one big bruise and am sure there were times I looked like it too. One time, I fell and landed on my knee; within a day it was so bruised and swollen I couldn’t use it for a couple months. That same knee, in fact, still bothers me occasionally with bouts of runners knee. Another time, I was simply sitting on my Harley Davidson in the garage because I hadn’t had a chance to ride in quite awhile and just wanted to sit on it for a minute. When I stood up to get off the bike, I got really dizzy and started to fall so I grabbed onto the bike. This was not the best of supports, as I’m sure you can guess, and within seconds I was laying on the floor with the bike pining the top of my leg. Due to the blood thinners, the bruising to my leg from this incident lasted for over a year. It wasn’t a hair raising fun ride that I spun out of control and had a story to tell. Nope. I suffered a year from simply sitting on a motorcycle in my garage. How could I not believe life as I knew it was over? Then, somewhere along the way I was shown some statistics that placed my expected life span, based on my heart conditions, at less then four years. As my condition worsened and more medications were prescribed by my doctors, that life span statistic started to seem more and more real all the time. How could it not? I couldn’t walk between rooms of my house without incurring injury! I rarely thought about the fact I would one day need a surgery to replace my device for a low battery, mostly in part due to the fact I really I would be dead long before the battery was dead.